"Affordable and accessible spectrometer integrated within a mobile phone, which can be used for health, medical diagnostic, environmental monitoring and science." 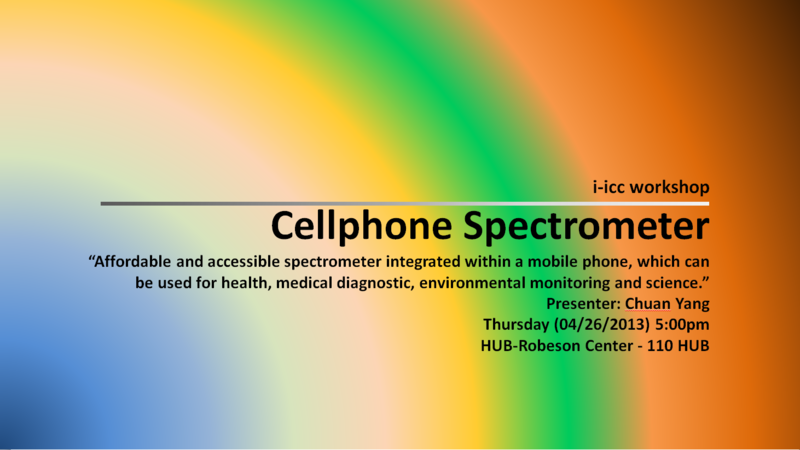 Mr. Chuan Yang, one of the winners from the 2013 Vodafone Americas Foundation's wireless innovation project competition, will briefly introduce his experience on spectrometer at 5pm this Friday (04/26/2013) in HUB 110. This workshop will be an entry-level discussion forum for knowledge spreading and the attendances with fundamental backgrounds in science and engineering should be easy to follow the story of technology. The closely related majors will be: electric engineering, material science, computer since, and technology innovation, etc. In the spirit of innovation.